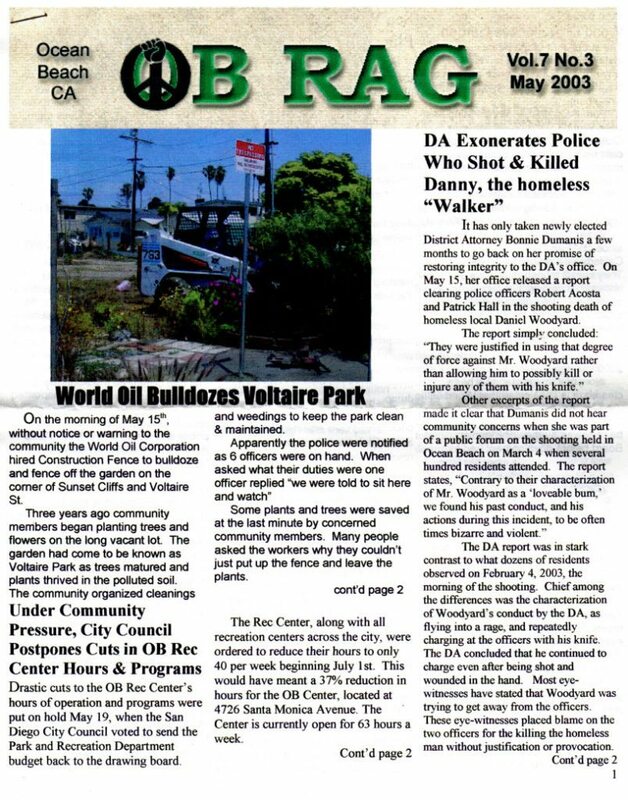 Once upon a time, a citizen-created park existed at the busy corner of Voltaire Street and Sunset Cliffs Boulevard. It had been created and then was maintained by folks from the Ocean Beach Grassroots Organization and supporters. After the departure of the last business at the location – on property owned by World Oil – the lot had become an eye-sore with weeds and trash strewed about. Without authorization from the City or World Oil, OBGO took it over, uprooting the weeds, dealing with the junk, picking up the old asphalt, and planting flowers, trees and bushes. And watering it. This went on for a couple of years. Over that time, OBGO worked with the City and World Oil to remove more debris and keep up the appearances for the neighborhood. A couple of memorials – one for Stephanie, and another for Danny Woodard – were put in. Then one day, without warning, bulldozers, workers and a van of police arrived. They quickly threw up a fence, bulldozed everything. And now the lot still stands as an eyesore. These shots were taken by Marc Snelling. Ive got a photo Tito left with me. I belive it’s the bulldozer getting ready to make it’s assault on Voltaire Park I’ll see if I can find it and post it. Older Article: Where Is the National Security Agency’s ‘Secret Room’ for San Diego?